(L-R) Minister Herbert (VIC), Minister Close (SA), Minister Rockliff (TAS), Minister D’Ath (QLD), Minister Ryan (Cwlth), Minister Fitzharris (ACT) and Minister Barilaro (NSW). NT participated via videoconference. On Friday 1 April, the skills session of the COAG Industry and Skills Council (CISC), chaired by Senator the Hon Scott Ryan, Minister for Vocational Education and Skills, convened in Sydney for its fifth meeting. Ministers from all jurisdictions, excepting Western Australia and New Zealand, participated in the discussions. Ministers discussed a range of topics under four general themes – industry responsiveness, funding, quality and data. The meeting’s communique is available online, as is Minister Ryan’s press release. During the week commencing 5 April 2016, a delegation from the Ministry of Employment and Labor and the Korean Research Institute of Vocational Education and Training visited Australia to progress activities under a Memorandum of Understanding on Cooperation in Technical Vocational Education and Training between the Korean and Australian governments. A key focus of the discussions was a bilateral benchmarking project, an outcome from Minister Birmingham’s visit to Korea in July 2015. The project aims to benchmark the required skills for specific occupations across Australia and Korea. This work will involve discussions with industry and is intended to facilitate a common understanding of occupations across the two countries. There was agreement to progress benchmarking activities in manufacturing and information technology as a first stage. While in Canberra, the delegation met with various areas of the Department of Education and Training to further policy discussions in areas of mutual interest. The Korean delegation also met with a number of VET stakeholders in Sydney. For more information on this project, or to express your interest in further engagement with Korea, email InternationalSkills&VET@education.gov.au. Given the central role that Industry Reference Committees (IRCs) play in the new industry-led arrangements for training package development, the Australian Industry and Skills Committee (AISC) has commenced their review of IRC structure and membership. The purpose of the review is to ensure each IRC provides the best possible industry coverage and expertise to support training package development for their industry sector. It is imperative that the membership of IRCs is not only appropriate to the task, but also has effective reach into the industries it represents. Importantly, the review acknowledges the variation across industry sectors and the need for flexibility when reviewing the structure and membership of IRCs. As such, the review will carefully consider each IRC on an individual basis. The AISC is committed to the review being open and transparent, with ample opportunity for a broad range of industry stakeholders to provide input into the eventual shape and membership of their IRCs. During consultation, industry input to the review will be essential in ensuring the resulting structures and memberships are an accurate reflection of the advice and support needed to inform the review and development of training packages for each sector. More information on the work of the AISC can be found on their webpage. Are you currently employed, aged 45-54 and thinking about a career change? The Skills Checkpoint Pilot is a free career advisory service that offers practical advice to mature aged workers looking to reskill or transition into new roles. “… I feel re-invigorated to actually do something about my current career and have been given lots of advice on alternatives." "It helped give me direction in my career path I might never have thought about." Skills Checkpoint services are provided across the ACT, NSW, Queensland, Victoria and WA. If you would like to take advantage of this great opportunity to understand your current skillset, learn about growth sectors and receive a personalised career plan, you need to act quickly. 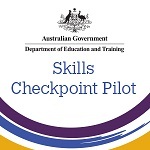 The Skills Checkpoint pilot ends in May 2016. To find out more, please go to the Skills Checkpoint webpage on the Australian Government Department of Education and Training website. On Thursday 24 March, in recognition of World Autism Day, the Department of Education and Training’s Australian Training Awards and Australian Apprenticeships Ambassadors programme hosted a forum aimed at recognising and educating members in the community about the barriers and stigmatism that those on the Autism spectrum face. The forum featured the Racing with Autism team, an organisation that raises awareness of Autism through sharing Canadian go-kart racing champion Austin Riley’s story with schools and teachers. Also presenting was Jeanette Purkis, Autism Asperger ACT representative, the department’s Ability Network Champion and author of several books. 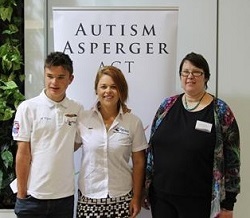 Please take the time to watch the forum and other inspirational presentations by Racing with Autism’s Austin Riley, Australian Apprenticeships Ambassador and Australian Training Awards finalist, Jessica Benge and Jeanette Purkis that are guaranteed to leave you with a greater awareness of the difficulties faced by those with Autism. 2016 WorldSkills Australia - Be part of it! In addition to exhibitor stalls, organisations will also have the opportunity to host fun, interactive skills demonstrations as part of WorldSkills Australia’s popular Try’aSkill program. Try’aSkill demonstrations encourage visitors to test their hand at a range of basic tasks using different types of techniques and tools required in a large variety of trade and skill-based professions. 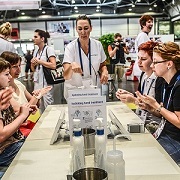 Applications for the careers expo are now open: register or read more on the WorldSkills website. 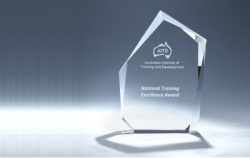 The Australian Institute of Training and Development (AITD) National Excellence Awards recognise excellence in learning and development and in organisational development. Nominations are now open for the 2016 National Training Excellence Awards. Nominations will be accepted in categories related to blended learning, gamification/simulation, social/collaborative, technology and more. Information about the Awards categories, criteria and nomination process can be found on AITD’s website. Submissions must be received by 5 pm (AEST) on Friday 29 July 2016. Late applications will not be accepted. Australia is currently experiencing skills shortages in many sectors and apprentices, trainees and a skilled workforce are vital to the economic development of Australia. National Skills Week helps highlight VET’s diversity and its options and opportunities by encouraging, informing and inspiring people of all ages to explore the benefits of undertaking vocational education and training courses. Want to get involved in National Skills Week but don’t know where to start? Visit National Skills Week website. Students can now use a new simplified tool to easily recover a forgotten USI or reset a forgotten password. If they know their email address or mobile number used when creating their USI, they will no longer need to enter all their personal details, undergo an evidence of identity check, or correctly answer security questions. Personal details (Please note that this option has also been simplified but a document verification service or individual’s security questions will still need to be checked if this option is selected). The Forgotten USI and Forgotten Password Fact Sheets are now available for RTO staff to distribute to students, include in enrolment packs or simply print as posters. For up to date information, please visit the USI website. VETNet, a central storage facility for relevant current and historical materials relating to the national VET sector is now available. The facility is designed to allow you to find information about training packages quickly and easily, just by using the search function. VETNet will support transition to the new arrangements and ongoing development of training packages and includes information such as companion volume implementation guides. The Australian Training Awards is seeking to establish a panel of evaluators to support the judging process for all organisational categories and the Lifetime Achievement Award. The panel will be active for a period of three years. The Request for Tender will close on 13 May 2016. Find out more on the AusTender website. Australian Skills Quality Authority's (ASQA) 2016 program of training provider and course owner briefing sessions is now in full swing. Sessions have been held in Sydney, Darwin, Perth, Alice Springs, Melbourne, Canberra and Brisbane with a further 25 sessions to be held through to 2 June. the new-look ASQAnet, which is currently being developed. developing enterprise units of competency. For more information, or to register to attend an event, visit the ASQA website. Sustainable skills development strategies can be life-changing for local communities and transformational for economies. Find out why skills are emerging as the currency of this century in the SkillsDMC’s latest whitepaper, Skilling Pipelines: the Link to Sustaining Productive Workforces. The new Civil Infrastructure Onboarding Skills Set resource kit supports safety and productivity for the Civil Infrastructure Industry and contains everything you need to train and assess employees joining your workforce. Discount available until 13 May 2016. Read more. The 2016 WorldSkills Australia National Refrigeration Competition will take place in Melbourne from 17–19 May. Ten of Australia’s best young refrigeration apprentices, trainees and students will have just 18 hours to demonstrate that they have the best refrigeration and air conditioning skills and knowledge in the country. Read about three Australians who’ve already established their credentials in this occupation. Liam Janetzki was only a few days into his Australian Apprenticeship in refrigeration and air conditioning when he realised that it was the career he wanted to pursue. He enjoyed the mix of mechanics, complex electronics and thermal dynamics that the Australian Apprenticeship offered. 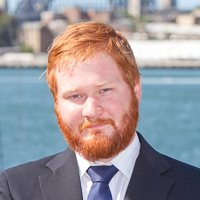 From securing first place in the WorldSkills Australia Regional Competition in 2009, Liam went on to win the 2010 WorldSkills Australia National Competition and walk away with the silver medal at the WorldSkills International Competition in London. 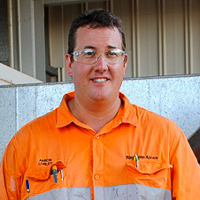 Completing his Australian Apprenticeship in December 2010, Liam began working at the state-of-the-art Southern Queensland Correctional Centre for Qbuild, undertaking facilities maintenance. Read more about Liam. Jack Rossington’s Australian Apprenticeship was a pathway to a great career and helped him achieve highly in his chosen field. Throughout his apprenticeship with MIGAS he met some great people and was recognised for the effort he put into his work. Jack has earned numerous awards including Skill Tech Australia’s 2nd year Refrigeration Apprentice of the Year 2011, Air-conditioning Apprentice of the Year 2011 and Abigroup Construction Apprentice of the Year 2012. His clear aptitude and passion for his trade won him a position as one of 21 Australian Apprentices who attended Group Training Australia’s Today’s Skills: Tomorrow’s Leaders program in Canberra during August 2012. Jack is now an Australian Apprenticeships Ambassador. Read more of his story. 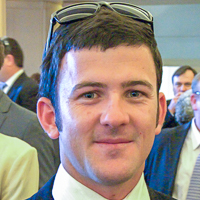 Aaron Lobley, a degree qualified school teacher and vocational education trainer, re-started his career at the age of 35 as an Australian Apprentice in air-conditioning and refrigeration. Completing his Australian Apprenticeship in record time with the support of Skill360 Australia, Aaron was offered full time employment as an Electrical Air-conditioning Maintainer with his host employer, Rio Tinto Alcan. In 2014, he was named Combined Trade Apprentice of the Year at the Western Cape Apprentice and Trainee Awards and runner up in the Skill360 Mature Age Apprentice/Trainee of the Year Award and in 2015 was a finalist in the Australian Apprentice of the Year Award at the Australian Training Awards. Read more of Aaron’s story. The 2016 conference theme is Growth through Collaboration. Registration is open for the 25th National Vocational Education and Training Research Conference No Frills. The National Centre for Vocational Education Research (NCVER) is delighted to co-host this year’s conference with CQUniversity. Don’t miss the early-bird rate for the ACPET National Conference and Asia Pacific International Education Forum. This year's theme is Connecting Knowledge skills and Futures through Innovation. Register now. Perth, WA - 21 June. Advanced Training have training credits for purchase that will secure your left over budget and give you 12 months to use this against Microsoft training. Your benefit? 20-50% discount depending on the amount purchased. If there is something of interest to you or your team not listed, please email Advance Training or call (03) 9600 3600. If you are looking to get certified, Microsoft have just released their Booster Packs that give you options of 4 free retakes and practice exams. Find out more. SkillsOne’s recently-launched channel, Heating, Ventilation and Air Conditioning, provides videos and information about career opportunities in the diverse and complex Air Conditioning and Mechanical Services industry. Visit the new channel to learn more about the many technical jobs at the cutting edge of technology, environmental and energy efficiency issues. Our workshop on Business Case Writing is suitable for anyone who wishes to develop a clear case for business decisions. You will learn how to define the parameters, risks and management factors involved within the project, and lay out a lucid and persuasive argument in favour of your case. Read more about the workshops and available dates. The VET PD Network seeks to support the capability and capacity of the VET sector by providing a range of professional development opportunities for RTOs, including practical, solution based face to face workshops. Visit their website for additional titles and more information or go to their Contact page to register for a workshop in your location or discuss other professional development services. ACPET is a national provider of professional development training and is recognised for promoting excellence in education by providing high-quality PD programs. ACPET ensures the quality of its PD programs by engaging presenters who are highly experienced and well regarded industry professionals. ACPET has the PD programs you need to succeed and give you the competitive edge. Gain new skills or enhance your knowledge with our quick one hour webinars and half day workshops. ACPET’s range of Professional Development webinars are available to everyone and allow you to up-skill on your own terms, as webinars can be undertaken at the time of the actual webinar or at a later date by purchasing the webinar recording. With a range of PD events on offer, there is something for everyone from CEOs and executives through to academic, teaching and administrative staff. Should you require assistance to register or to purchase a recording, please contact the PD team at pd@acpet.edu.au or call (03) 9412 5900. View the upcoming webinars and workshops on the ACPET website. TAE Training Package - The long awaited TAE Training Package has been endorsed by the Australian Industry and Skills Committee (AISC) and is now available on the national register. Workshops will be held in the capital cities during May and July to inform RTOs who deliver TAE Training Products of changes to the new Training Package - the qualifications, the units of competency, and the skill sets; and how to ensure a smooth transition. The workshops will focus on implementing the Training Package and how to update materials and staff. Limited spaces - Register now. Systematic Validation – Stepping Stone Process. VOCEDplus – the latest research on VET, skills and workforce development issues. If you would like to provide feedback, supply an article for inclusion in the next edition or join our list of subscribers, please email skillsatwork@education.gov.au. The next edition will be published in June 2016. Submissions are due by Wednesday 18 May 2016.